Ever wonder why credit card debt is so hard to pay off? Unless you receive a financial windfall, like winning the lottery, credit card debt is designed to virtually never decrease! Why is this? Simple. The banks fought hard and won the right to charge interest rates without any limits! 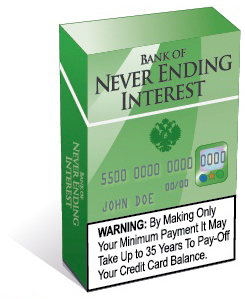 Think about it, a credit card company has the only product where they can raise your price after you purchase it by simply increasing your interest rate! Also, there are no limits on how long it takes to pay them back. They take advantage of this by charging minimum payments that are so low they not only lure you into borrowing more but can take up to 35 years to repay! You see, getting into credit card debt, with the deck stacked against you, is much like riding a bike downhill. Then, when you are maxed out, it feels like peddling uphill to the same place you just came from. So, instead of reading through piles of paperwork in search of an answer, give us a call instead! We know how to stop the insanity. Find a way to give your creditors their equitable share and drive you out of debt without peddling uphill!